Learn How to Play Saxophone like a PRO! You're keen to join the ranks of great Saxophone Players? Maybe you want to start learning? Possibly you already play, but want a few handy hints to help improve. Alternatively, you may be a fan of certain great players and seek more information about them? Either way, one thing is for certain, you just love the sounds a Sax makes and that sound has got hold of you, right down in the bottom of your stomach! As you search through the parts of this website that interest you, I hope you'll find many helpful articles on all aspects of the incurable disease that Sax Players have all been infected with. Where did the Sax come from? The Saxophone Players Guide is intended to serve as a comprehensive reference with easy to understand information which covers all aspects of the Saxophone. Our aim at Saxophone Players Guide is to help improve your abilities and experience as a Sax Player by teaching you tips and tricks along the way. This site is aimed at everyone from beginning to advanced players. But for those who are realbeginners, you'll find some great tips throughout this site on picking up a saxophone for the first time. As a learner I picked a Sax that was far too big for me. And with a whole lot of perseverance, I turned out alright. For the advanced player, well I have one tip, "keep an open mind and you might just be pleasantly surprised what you pick up". This guide is a culmination of my experiences as a Sax Player over the last twenty years. When I first started out, all I knew was that I wanted to to play the one with the curvy bit at the top, because it looks cool. Well...I've learnt a lot since then. Introducing the Saxophone as a musical instrument and Adolphe Sax, the man who invented the Saxophone. The Saxophone Family is more than just the 3 saxophones you have seen or heard about. There are actually many different sounding members of the Saxophone Family. Let us go and explore them.. Learn about the different Saxophone Parts and what they do. There are many Saxophone Accessories that can improve your experience when playing the Sax. Dedicated to some of the most incredible musicians... EVER. Here are the stories of these many Famous Saxophone Players. Keep your horn in good shape with a yearly tune-up or Saxophone Repair. Learn to play saxophone, it's not as hard as you think. 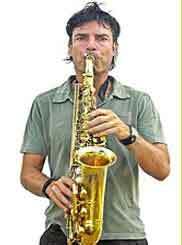 Here you'll find some simple things that you can do to play Sax like a guru.